And it was named by a crowdsourcing campaign. Between Pontiac, Saturn, Oldsmobile, Hummer, and Saab, General Motors has shut down more brands in recent history than it's created. But this time, it's launching a new one. It's called ARIV, and it's dedicated to selling electric bikes. GM arrived at the name after launching a crowdsourcing campaign a few months ago, and is now bringing it to market with two eBikes – or rather two versions of the same: the Merge and the Meld. The main difference between them is that one folds up for easier storage and transport, and the other doesn't. Both the Ariv Merge and Ariv Meld feature the same specs and design, and it's a rather handsome one. The relatively small wheels (customary on this type of eBike) are joined by a single, bent aluminum bar. The seat support creates a nice clean line to the kickstand (passing behind the pedal box and battery), much as the handlebar upright does to the front fork, which itself melds (or merges) nicely with the frame and down to the rear fork. 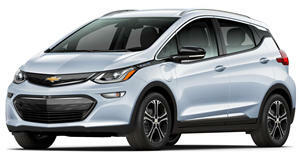 Instead of sourcing one off the shelf, GM designed the 250-watt battery, drawing on the experience gleaned from electric vehicles like the Chevy Bolt. The bikes can reach speeds of 15.5 miles per hour, with four levels of pedal-assist power, can travel for 40 miles on a single charge, and take about three and a half hours to charge from empty. They also feature USB chargers for keeping your phone topped up, along with integrated, rechargeable LED head- and tail-lights, and disc brakes at both ends. Ariv is initially launching in European markets like Germany, Belgium, and the Netherlands, where eBikes are particularly popular. Pricing starts at about $3,000, with pre-orders open now on BikeExchange.com for delivery in the next few months.